Why Should Your Company “Go Green”? Green business will follow the same growth curve that company websites did in the ‘90’s. If your company had a website in 1990, you were way ahead of the power curve. If you had a site up in 1995, you were running with the pack. But if you didn’t have a company website by 2000, you were non-existent to many consumers who saw websites as a credible means of assessing the company’s viability. In 2010, green business is becoming the rule, not the exception, and consumers will come to expect it as a prerequisite to patronage. 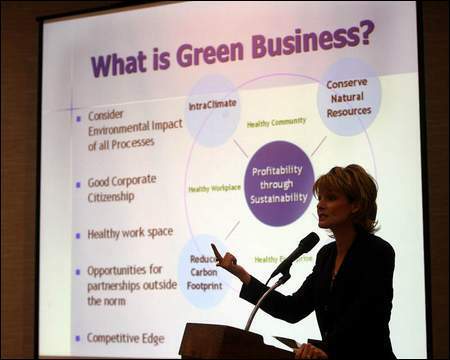 Now is the time to make your business a Green Business. Regardless of the size of your company, Buck Consulting can help you “go green”, and most importantly, ensure your customers know that you adhere to environmentally responsible business practices. Consumers prefer companies that demonstrate good, corporate citizenship. Let Buck Consulting help you increase profitability through sustainability. You are right! Many managers don’t know, that they can’t eat money. ‘sustainability’ is the neccessary keyword in our time. But there are a lot of black sheeps, particulary in the BIO – Food sector. In the Sector of renewable energies we have a seriously profitability problem in Germany due to lack of price acceptance by consumers. Furthermore we have difficult technical problems to transport windenergie from north to south. Are you active in Germany?